If you’ve been reading my blog for awhile, you already know about Aaron Burdett. Last summer I made three blog posts about him and his music. The first one was in July 2017 and it features the song that Aaron performs in podcast episode . Three or Four Minutes is off of his CD, Breathing Underwater. You can find the lyrics in that blog post if you’d like to sing along – a great way to practice your English. Last August, I linked to Aaron’s performance of Pennies on the Tracks at TEDxTryon. Have you ever laid a small coin on a railroad track to see how it is flattened when the train runs over it? The railroad can be a dangerous place and the building of the famous Saluda Grade was deadly. You can find the lyrics to that song in the blog post, too. In the next post, I featured another song off of Aaron’s latest CD, Refuge. It’s a Living is a song that many of us can relate to at some point in our lives. That’s one of the reasons I like Aaron’s music so much. He tells stories about life and every day living. The lyrics are like poetry to me, his voice both strong and tender, and he’s a great guitar player. In Episode 026, Aaron and I talk about the universal language of music and how it can touch us and change our concept of time, kind of like what happens when you are in deep conversation. You have no idea of time passing or what’s going on in the physical space around you. Or when you are immersed in a good book and escape to a place and time that touches your soul. Language can do that and so can the mysterious language that we call music. Put the two together and it can have a powerful effect. In Episode 027, Aaron shares a bit about his creative process and also about performing. I think what he says is very applicable to language learning. At the end of the episode he gifts us with one of my favorite songs, Looking for Light, also off of the Refuge album. With his kind permission, I’ve posted the lyrics below. It was a true pleasure to have Aaron on the podcast right here in my studio (living room). And it’s an even greater pleasure to share his music with all of you listening in. You can find his music on iTunes, Amazon, Spotify, and many other vendors of good music. 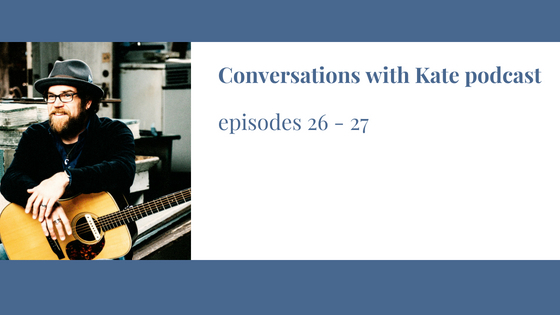 With Episode 027, I had to upgrade my Soundcloud account again so if you like the podcast, please consider becoming a Patron and joining the Conversations with Kate Patreon community. This is Kate. Remember that every day is a gift. Thanks for listening. Playing with Words – A conversation with Kirstin It’s all happening over on Patreon!